Last time, we talked about clarifying the initial concept for your theme event, and communicating it to your invitees. I provided examples of the kinds of party themes my wife and I have produced over the years—this isn’t all of them, mind you, just a selection I threw up onto a links page. Producing events is also something I do professionally. You can find out more about my services at my business website, greenfutureconsulting.info. Now you have a theme, venue, and budget. Onward to Killer Theme Party Principles™! Here’s the meat of putting on the party, Get this stuff right, and you’re all set. KTPP 1. Everything matters. When you’re trying to create an atmosphere—even if it’s tongue-in-cheek and lighthearted—the more care you can put into having everything at your party consistent with the theme, the more your guests will immerse into it. So take some time with your invitation, your own costuming choices, decoration and music selection. Attention to detail is the difference between an event guests will always remember and just another party. KTPP 2. Before the Party, Make Sure Guests Get It. You might think your theme idea is obvious, but assume your invitees don’t understand it. Communicate as much as you can about your theme in advance, so they get the concept of the world you want to create. Help them not to panic about what to wear by providing costuming examples. The most important way to do this is in your Invitation. I use a free online service called Socializr which lets you design and email attractive invitations, manage lists and track RSVPs. It’s better than Evite, in my opinion. Be sure to let invitees know if uncostumed guests are welcome. I generally reassure my friends that I want to see them more than I care about what they wear. If you have them, you can also provide some stock costume pieces for guests to borrow during the party. KTPP 3. A Good Party is made of FADDLMAC. It rhymes with “Saddleback”, and it stands for Food And Drink, Decorations, Lighting, Music, Activities and Costuming. Those are the ingredients of a successful theme party. Get those right, and your guests are having a great time. Food And Drink. Unless your party specifically demands it, stick to finger food. There is far less cleanup, and you don’t have to provide a place for every guest to sit so they can use cutlery. If using a caterer, make sure your offerings are self-contained and do not include goopy, staining dipping sauces. A theme potluck can be a lot of fun, and can actually be a theme itself (“Lamentable Food of the Fifties”). Be sure to prime the pump, providing some kind of thematic cocktail or libation, a non-alcoholic alternative, and some food so early guests have something to sample besides their own offerings. If you’re doing potluck, remember to provide enough table or counter space for food and drink offerings. Decoration. Create as much of an immersive environment as you can with props, wall-mounted images, and set pieces if you have access to them. Everywhere a guest stands, s/he should be able to see something relating to the theme, even if it’s only a picture on the wall. Your budget is obviously a limiting factor, but with a little creativity, you can do a lot. 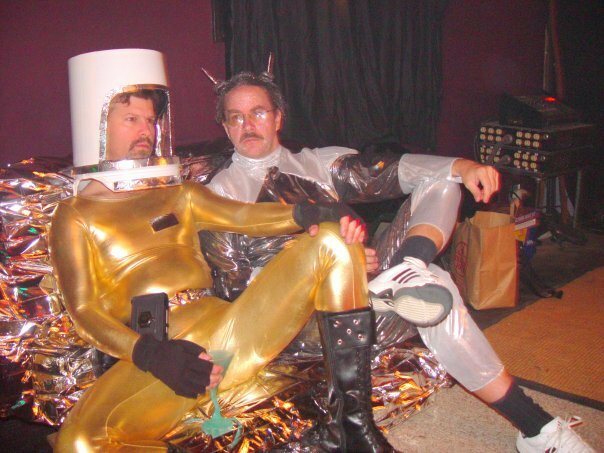 When we threw our Space Escapade party, we covered all of the furniture in the party space with mylar space blankets, turning the room metallic and futuristic. Add some red and green colored lights, a borrowed futuristic art piece we hung from the ceiling, and a cheap fog machine from a party store, and we were partying at Moonbase Alpha! On the other hand, our annual Pre-Rafaelite Picnic is held at a mid-19th century rural cemetery, and the only “decoration” is keeping the china and food containers period-appropriate, such as baskets and Mason jars, and hiding everything modern under Victorian-style tablecloths. Easy. There are affordable, wall-scale background images printed on thin vinyl called “Scene Setters” available from party stores. Mounted on a wall (Blu-Tac again), they can make a big difference in creating your theme world. Some of them are kind of cheesy, but if you’re selective, they can be helpful. We used something called “Freddy Krueger’s Boiler Room” at our steampunk party—it was perfect. Again, don’t be wasteful: save ‘em and use ‘em again. The color laser printer is your friend. Printed historical or public domain images from the Internet that illustrate the theme are a great, cheap way to decorate. Use sticky putty so you don’t damage walls or paint when you take them down; if you have a bigger budget, you can invest in a bunch of cheap frames of standard sizes and reuse them over and over. Poster-sized printing is available at most digital printing shops. Avoid jarring visuals. Do what you can to keep the spell from breaking. There are very few themes for which those red or blue plastic party cups are a good visual fit. Get a bunch of reusable clear acrylic wine glasses, and use those instead. When it comes to china, glassware, etc., be responsible: minimize waste, and use washable and reusable items as much as possible. You can, by the way, wash and reuse those plastic cups after your Seventies Frathouse smoker. Lighting. For indoor events, keep the lighting low and indirect rather than from overhead. People feel more anonymous and less observed in lower light conditions—they’re less likely to dance and be playful if the lighting implies they are being interrogated. You can start brighter early on and dim when the party is really going, or have brighter areas near the entrance, food and drink, and a dance space with dimmer light. All the usual dance club tricks apply: where appropriate. colored lights, mirror balls and so forth can add to the festive feeling.